Bitumen Market size was estimated at USD 84.3 billion in 2017 and will exhibit growth of over 3.7% up to 2025. Bitumen market is mainly driven by increasing government policies towards roads and infrastructural development by using Public Private Partnership (PPP) models across developed as well as developing nations. This has resulted into growing utilization of the product in road construction and maintenance industry. The product is widely used as a binder mixed with aggregate particles to form asphalt concrete. Upsurge in the bitumen usage, especially in roadways, waterproofing, insulation, etc. will reinforce the market in the construction and infrastructure industry. For instance, The U.S. road network exceeds 6.58 million kilometers in total length, making it the world's longest road network. Increasing road construction & maintenance activities to create a superior quality transportation medium will drive the market in near future. The global bitumen market is witnessing robust growth in the construction sector, especially in developing regions. This is attributable to an increase in the application of bitumen in waterproofing purposes, ceiling-binding and as adhesives in wood industry. Other minor factors include growing application of bitumen in paints & coatings, inks & dyes, etc. Bitumen serves as a building block that facilitates design and engineering of the bitumen motorways, streets, runways, highways, driveways, airport, coastal protection, canal linings, reservoirs, parking areas footpaths cycle paths, as well as sports and play areas. Bitumen paved roads & highways are fairly low maintenance but require timely repairs and resealing in average climatic conditions. However, high chemical fume emissions, lack of color & design choices, and shorter lifespan of bitumen will result in shifting to alternative options like concrete and bio-asphalts due to its environment friendly and non-toxic nature of the latter. 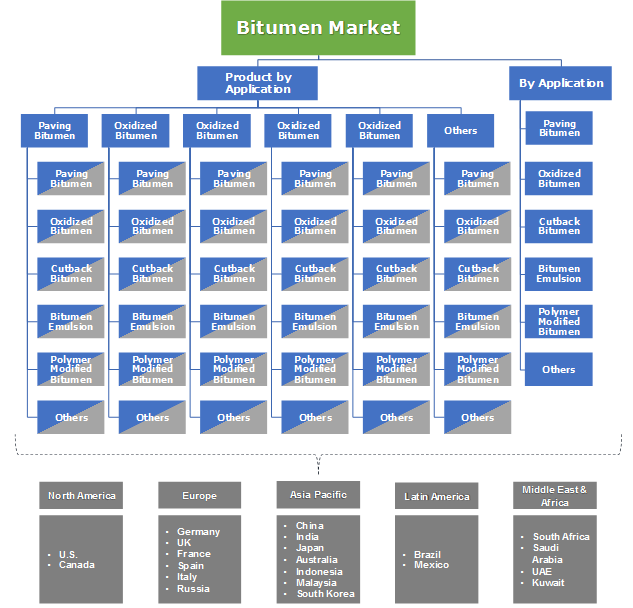 Hence, such factors will likely restrain the global bitumen market growth. Based on product, the bitumen market has been segmented into paving, cutback, and oxidized bitumen, bitumen emulsion, polymer modified bitumen and others. The paving bitumen segment contributed almost 70% in the overall market and is expected to retain its share due to rapid road maintenance and construction activities all over the world, especially in Asia Pacific. The product also has got extended applications in construction of greenhouse floors, running tracks, bicycle paths, runways, railway beds etc. Based on revenue, the polymer modified segment (PMB) held a substantial market share of more than 10% owing to its extensive usage in road surfacing and industrial applications. Addition of polymers in normal bitumen enables the mixture to become more cohesive with significant resistance to deformations for road pavements. Oxidized bitumen is poised to gain moderate market share from 2018 to 2025. The global bitumen market has been segmented on the basis of application into roadways, waterproofing, adhesives, insulation, and others. The others segment comprises of minor sectors such as turfs & grounds, paints and coatings, etc. In 2017, roadways industry held a prominent share of more than 80% of the market. Increasing population coupled with advanced living standards has significantly given rise to global traffic leading to construction of number of heavy duty roads and flyovers along with widening of the existing roadways. This trend is projected to boost the overall industry growth during the forecast spell. In 2017, waterproofing industry held the second highest market share of the industry and will witness growth at close to 4% CAGR from 2018 to 2025. Bituminous waterproofing is formulated to safeguard residential and commercial establishments. They are used to build roofs, such as roofing felt or roll roofing products. Asia Pacific will see significant bitumen revenue growth owing to industrial and infrastructural activities in China that held a regional market share of close to 40% in 2017. In the same year, India witnessed a good growth due to rising manufacturing and construction industries. The Indian market was valued at over USD 2.25 billion and is said to exhibit growth with over 5% CAGR in the forecast timespan. North America held a market share of around 30% in the total market. Increasing suburban remodeling practices in the U.S. will stimulate product demand for waterproofing applications during the forecast spell. In 2017, Germany bitumen market was valued over USD 4.5 billion and will grow with a slow but steady CAGR during the forecast timeframe. British Petroleum, Indian Oil Corporation, Royal Dutch Shell, Chevron Texaco Corporation, Total S.A., NuStar Energy, Marathon Oil Corporation, China Petroleum and Chemical Corporation, Villas Austria GmbH, Petroleos Mexicanos, Bouygues S.A., JX Nippon Oil & Energy Corporation, Exxon Mobil Corporation, Imperial Oil Limited, Nynas AB are some of the prominent players operating in the market. Some of the companies in the industry such as Kraton Corporation has developed a highly modified asphalt technology to meet the accumulating demand of the paving & roofing sectors. Bitumen market has strict environmental standards to be complied with, which makes it difficult for new players to invade the industry. The bitumen industry is indirectly related to the GDP of several countries globally due to its worldwide usage in road construction, waterproofing, and industrial applications. Moreover, increased disposable income will drive up the private vehicle ownership placing greater emphasis on road networks, which will eventually increase overall road construction projects globally. 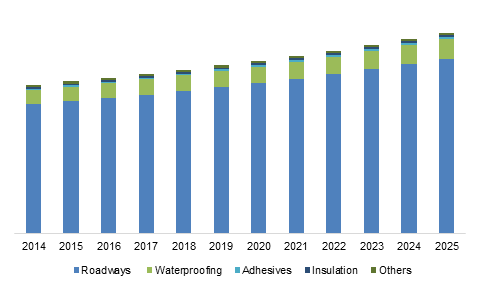 Lucrative product demand in application areas such as maintenance of bridge structures, tunnel liners, dams, reservoir and pool linings, racetracks, tile underlying waterproofing, will further propel the market during the forecast period.